Samsung Note 3 Neo is available online at cheapest price to offer you an unlimited entertainment experience. It comes with an Air Command function and S-Pen that will let you access some of the pragmatic features like Screen Write, Action Memo, Scrapbook, S finder and much more. Samsung Note 3 Neo price in India is around 20K, you want this phablet then buy Note 3 online at best price. The Samsung Galaxy Note 3 Neo sports a sizable 5.5” display, which has 720 x 1280 pixels of resolution, resulting in 267ppi pixel density. It has a faux leather back on the Note 3 Neo that ensures better grip. The textured back also gives the mobile a sense of style that was sorely missing in other Note devices. 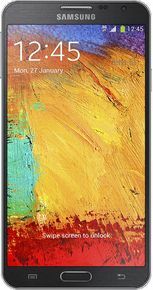 Samsung Note 3 Neo features hexa core processor, which includes a quad-core Cortex A7 clocked at 1.3 GHz and a dual-core 1.7GHz Cortex A15, supported by a Mali T-624 graphics subsystem. The Neo has 16 GB of internal storage and supports up to 64 GB more using a MicroSD card. Samsung Galaxy Note 3 Neo runs on Android OS v4.3 (Jelly Bean) on top of which is Samsung's TouchWiz nature UI. The device also comes pre-loaded with all the common apps and software features required for day to day usage that includes SMS, MMS, push mail, Gmail, Google Search, maps, hangouts, G drive, image/video editor, document viewer, etc. It is equipped with HTML5 browser, Java MIDP. The Note 3 Neo specification includes an 8 MP camera that comes with autofocus and LED Flash. The device can take full-HD videos. You also get different camera modes including Dual Shot, Drama Shot, Cinema Shot, Sound & Shot, Eraser, Best Face, and Beauty Face. The Note 3 Neo produces images with plenty of details. The colors look natural, and noise is under control too. Looking at it from the back, the camera and flash modules sit on top of the Samsung logo running across the breadth of the device. The Galaxy Note 3 Neo makes no compromises when it comes to performance. The beauty of the new SoC is that all cores can be used at the same time to share the work load, effectively giving you a 6-core chipset. The GALAXY Note 3 Neo’s sound quality is excellent. The bundled earphones are goo too. Samsung has thrown in plenty of equalizer and sound enhancements to play around with. Moving onto video playback, the Neo handles most 1080p videos without any issue. Samsung has all bases covered, with 2G, 3G, LTE, GPS, Wi-Fi 802.11 a/b/g/n/ac, NFC, and Bluetooth 4.0. Moreover, Samsung has added a multitude of sensors including an accelerometer, gyro, proximity sensor and compass. The Note 3 Neo packs in a 3100 mAh Li-Ion battery. With normal usage, it easily keeps the phone powered for two days. If you are planning to buy Samsung Note 3 Neo online then find the lowest online price by comparing online prices from various online stores like Flipkart, Amazon, Snapdeal, Cromaretail, Saholic etc. Get this massive smartphone at lowest price.